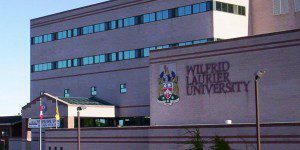 Wilfrid Laurier University opened its doors to students in 1911, then called the Waterloo Lutheran Seminary of Canada. Over the years, it has transformed into Laurier University. The AACSB accredited Lazaridis School of Business & Economics was established in 1966 and is one of the largest business schools in Canada. Laurier offers full-time and part-time Ph.D., MBA, Master’s, Economics, BBA, Bachelor’s, and diploma programs. The Lazaridis School also has a second, part-time MBA campus located in Vantage Venues in the core of downtown Toronto where they offer a part-time weekend MBA and executive-format Master of Finance programs. The Lazaridis School of Business & Economics’ main campus is located in Kitchener-Waterloo, Ontario, Canada, located about 62 miles west of Toronto. Laurier maintains a second part-time MBA campus in Toronto, Ontario in Vantage Venues. Vantage Venues is located on the 27th floor of the Sun Life Financial Tower. Here, Students can pursue a part-time MBA or executive-format Master of Finance programs. The Toronto campus has quick access to the PATH subway system. The two towers of the Sun Life Centre share an underground connects to St. Andrew Station. Since 1999, Laurier’s Toronto MBA campus has been located in Vantage Venues in the Sun Life Financial Tower. The Lazaridis School occupies the 27th floor. Vantage Venues offers students a corporate learning environment for their studies in a location convenient to students already working in downtown Toronto. Vantage Venues has a number of meeting rooms, management suites, boardrooms, and break-out rooms. The Toronto campus is located about an hour away from Laurier’s Waterloo main campus. Laurier School of Business & Economics has about 110 full-time faculty and 70 supporting faculty members. The faculty to student ratio is 1:25. Laurier enrolls around 80-100 students per year in the Toronto program. Those students are broken down into two classes of 40-50 in each. As many as 50 percent of the students are female. The Lazaridis School of Business & Economics in Toronto offers a part-time alternate weekend MBA with or without two additional degree options: CPA and Master of Finance. The school also offers a part-time alternate weekend Master of Finance and an Accelerated MBA. BEworks Brings In Lazaridis, Schulich Alum David Lewis, Ph.D.